To be able to use devices in the home automation, SmartHome, a bridge is needed to all the diversity of protocols. There seems to be no standard. If openHAB is running at home, and is configured, items can be controlled by Rocrail. 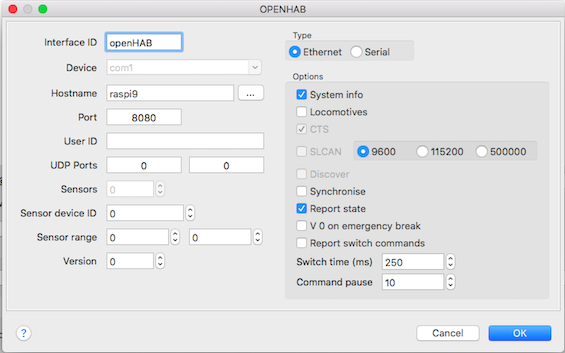 See the openHAB WEB site for detailed instructions on how to install and setup an openHAB instance. Add a controller with the "openhab" library. Set the hostname to the PC wehre openHAB is running. Set the port to 8080. At ON the Value is used for setting the brightness. The value must be in range o 1…100. MQTT action to inform Rocrail of an event. The output is referenced with the UID name, the address field can be left to zero. 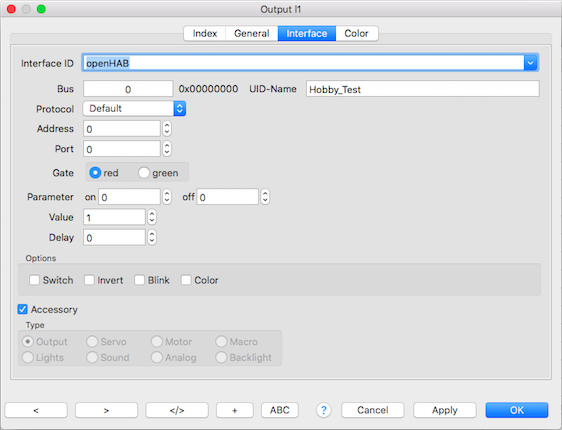 The UID name is in the openHAB context the Item name.